Floral print power! Flowers are everywhere and they will give joy to your walks. 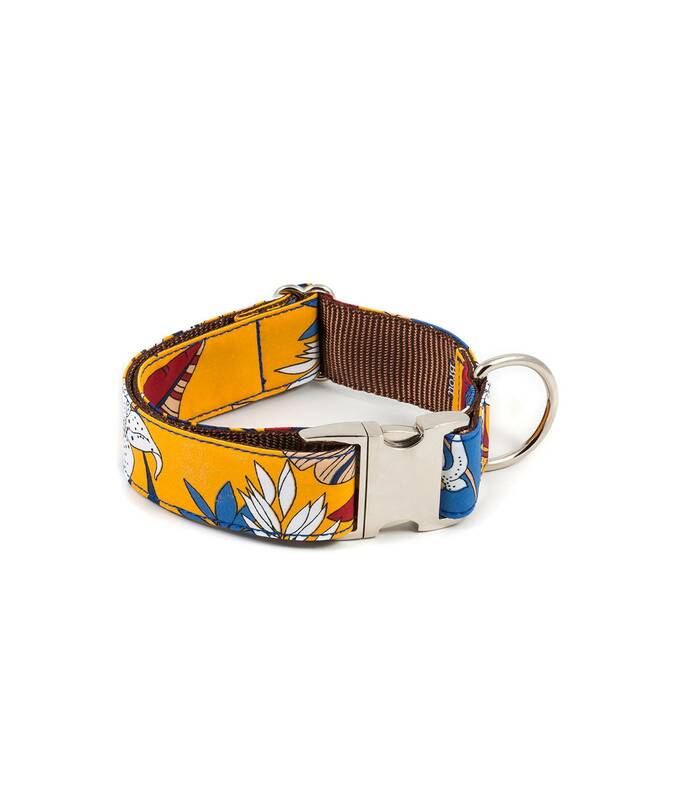 The dog collar Textura Fuliola gives off life and color with its mustard color and its contrast with blossoms of blue, two colors top of this season. Textura Sagaro necklace is made by hand with high quality brown nylon ribbon, very resistant and pleasant touch. The buckle used by Brott is made of high quality in cast aluminum and polished with safety lock. It can be complemented with the matching leash. Leash S 2 cm wide, 120 cm long. Leash M 2,5 cm wide, 120 cm long. Leash L 4 cm wide, 40 cm long. Leash X -training- Leash X -training-: 2,5 cm wide, 200 cm long multiposition adjustable lenght.